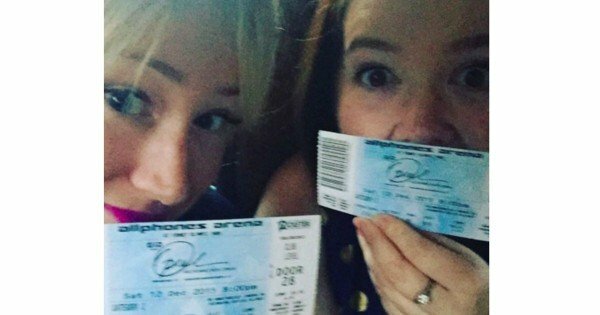 The lessons, the hymns, the sermons: Rosie Waterland spends a night at the Church of Oprah. I was raised in and out of many faiths (thanks mum! ), but as an adult, I decided to take a quiet step back from all that is belief-based. That lack of religion though, meant there there was a gaping hole in my vocabulary when it came to expressing shock or surprise: “Oh my God!” feels odd to say when I don’t believe ‘God’ exists. God herself. Image via Instagram @oprah. A while ago, I started to say things like ‘Oh Holy Oprah’ and ‘Praise be to O’ in place of the ‘G’ word, then it sort of stuck. I never really followed Oprah with any kind of fervor, but I considered Her the ultimate religious stand-in for privileged women without an official faith, so using Her name instead of ‘JESUS!’ when I stubbed my toe just seemed funny to me. 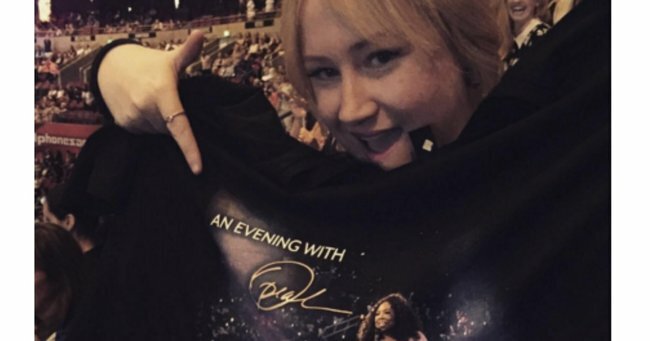 Basically, I’m an Oprah fan, but not the kind of fan who would spend money to go to Her show. I respect Her and think She’s brilliant, but there’s a lot of crap in my ‘saved’ list on ASOS and I’ve got bills to pay, so Oprah tickets are just not that high on my list. But would I say no if I was offered free Oprah tickets? HELL NO. I ain’t no dummy. Sun Super, who I assume were one of the official sponsors of her tour or something, offered two Mamamia staffers VIP tickets to see Oprah this past weekend. I went. I experienced. I breathed her air. 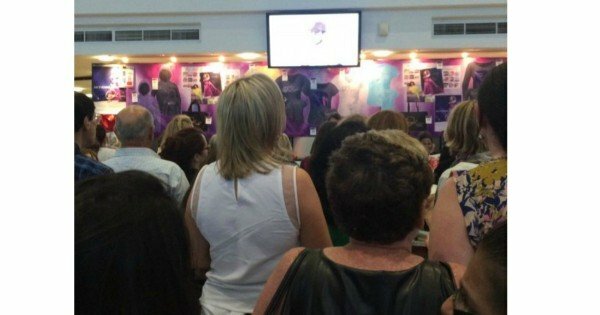 This is what it’s like to pray at the Church of Oprah. The chosen venue for worship was AllPhones Arena. I took my place in line with the other Believers and waited patiently to get inside. I’m not sure of this happens at every church but I was already a little frightened. It was $50, which I guess could be considered my donation to the Church, since I did get a free ticket. The Oprah Tour program, which after buying ugly t-shirt, I could not afford. Sorry Oprah. 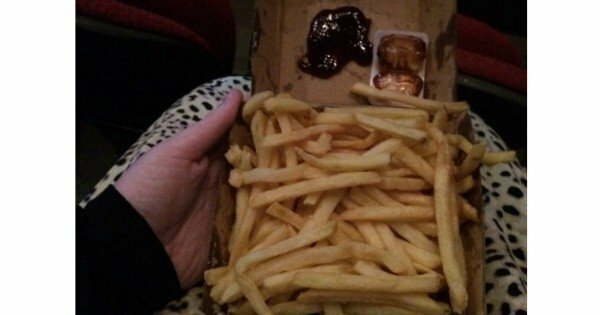 Soggy fries, which we lined up for almost 40 minutes to buy. Apparently at one point there were burgers, but by the time we made it to the front of the line they were sold out. Yes, I almost cried. 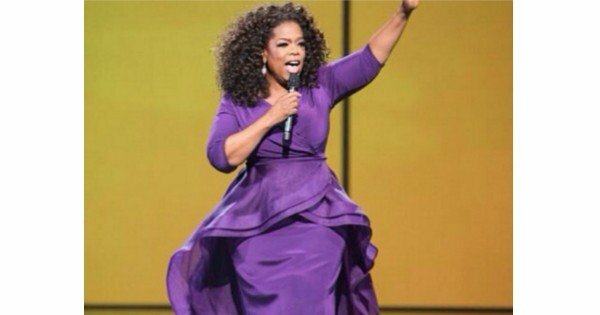 Oprah was almost an hour late to the stage thanks to a ‘ticketing issue’ (is that a regular church thing? ), so the Believers were entertained by DJ Faustina Agolley, who played every single song you would hear in a karaoke bar at a Hen’s Night. 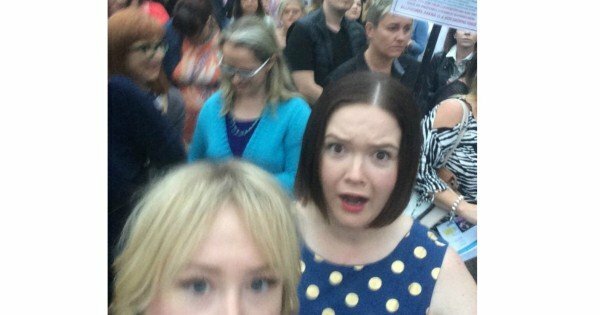 When we entered, fifty thousand people were dancing to Nut Bush, and right before the Lady herself came on stage, a massive ‘Aint No Mountain High Enough’ singalong made everybody forget that they were pissed off for waiting so long. Oprah talks about the most defining moment of her life – being kicked out of home at 14. Post continues below. Everybody who comes to earth comes here called. I’m a great manifester. I manifested every tree in my yard. I hired somebody to count my trees. Honour your calling. Life is speaking to all of us all the time. It’s our job to pay attention. Use your personality to serve the energy of your spirit. When things go wrong, it’s your life force trying to push you in the right direction. What’s your thread, and where on the journey is it leading you? You are co-creating your life with the energy of your intentions. The power to love is the greatest. Your life is speaking to you. Build a muscle of gratitude. You become what you believe in the world. The sermon ended with Oprah reciting a poem that she keeps on the wall of her toilet. Something about welcoming yourself home. She is a brilliant orator and it was a profound moment that left the entire congregation in tears. I was crying, but it was mostly still about the lack of burger. With that, the sermon was over, and we made an epic bee-line to the bus so we wouldn’t get stuck in Oprah traffic. I’ve been told that everybody walks away from church each week with a new sense of knowledge/feeling wiser/humbler etc. Here is what I learned praying at the Church of Oprah and Kneeling at the Alter of Platitudes. 1. Make sure there are still burgers before you line up for 45 minutes. 2. Learn the difference between photo mode and video mode on your phone. 3. If you haul arse out of the arena, you can skip an epic traffic jam. 4. Oprah is an incredibly wise woman, who, unlike 99.9% of us, has the time and money to really explore every possible way to be her ‘best self’. It would be easy to pop a joke in here about how most of us are just looking for a way to pay our ‘best rent’ and that if I could manifest anything, it would be my gas bill being paid. But she’s a freaking billionaire – worrying about car payments just isn’t her reality. Her reality is indulging in every motivational meme you’ve ever heard, figuring out a way to apply it to her life, and then teaching (mostly weeping) women how to apply it to theirs. There are worse ways to spend one’s time. I mean, she could have started Goop. But Oprah decided to teach ladies stuff. We can’t all spend our time figuring out how to ‘create life with the energy of intentions’, but isn’t that the point of Holy Figures? They do it perfectly, while the rest of us can only aspire to be just like them. Which I will now do, in my $50 t-shirt.